Without the correct engine oil, or using old engine oil, the engine is worn unnecessarily. The oil is for lubricating the important parts of the engine. Oil Change and oil filter change is included in the service manual's general services, so if you follow it, you are on the safe side. If you have an old car and want to save money on services, you should at least change the oil every 15.000 km or once a year, whichever comes first. The oil circulates in the engine to lubricate engine parts and sealing the engine and pistons. At the same time the waste products of combustion, where dirt in the air can be sucked into the engine, is transported away. The oil filter ensures that dirt and moreover sludge is filtered from the oil so it does not circulate and destroy the engine, or set as coatings. The oil circulating is kept clean, but some settle, and deposits like dirt in the oil pan. When you change the oil, it should be drained from the plug in the oil pan and the oil filter should be changed at the same time. To change the oil filter requires a special tool, which all garages have of course. You can buy an oil filter wrench for £10, – if you want to change the oil and oil filter. If you let the garage do it, you avoid getting oil on your fingers. Get 3 quotes on oil change and oil filter change. How important is the engine oil? Motor oil has several functions. It lubricates the car's engine, keeps the engine clean and is a regular part of the car maintenance, you should be aware of as a car owner. Remember to continuously check the oil level in your engine. It is recommended that you check the oil level about every 1,000-2,000 km you have traveled. If you use your car mainly for short trips and city driving, it's a good idea to check the oil level every 1,000 km, as this wears more on your car's engine. As a rule of thumb, it's a good idea to replace the engine oil once a year or every time you have traveled about 15,000 km. Check the instruction manual for the car, how often it is recommended that your car needs oil change as it may fluctuate. If in doubt, we recommend that you ask about it when you create a task. In the instruction manual, you can also see what other tasks that are in the different types of service. Some newer cars have service intervals of up to 50,000 km, because they use a special oil. Here it is even more important to use the correct oil, both to preserve the warranty, but also not to wear unnecessarily on the engine. 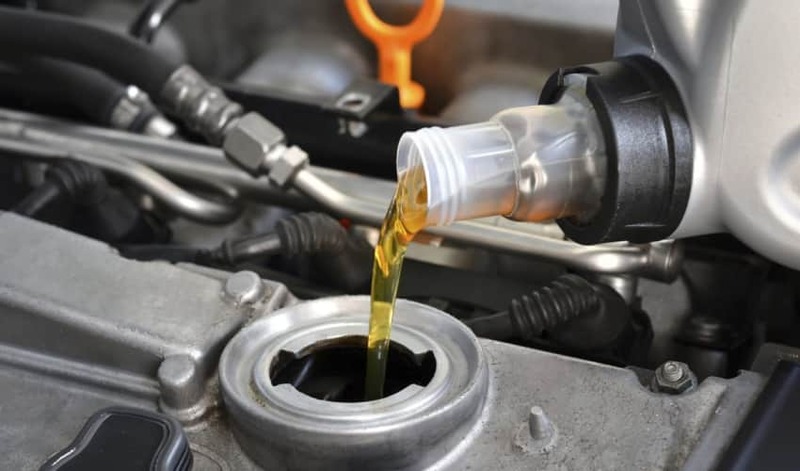 The price for oil change is in the low end of the scale compared to other of major maintenance tasks – so it's overall a good investment in your car economy and engine life. Remember to use the correct oil when you need to refill – you can see which oil, your car uses in the instruction manual. It's always a good idea to have a bottle lying in your car so that you can refill if oil level is low. The best thing is to get a liter when you leave the garage, so you use the same oil as already filled. That way you are sure that you use the correct motor oil. Synthetic or ordinary motor oil? There are many options and qualities to consider when one chooses motor oil. Certainly, there is more than just lubrication to think about. For example, some people choose completely synthetic oil because its viscosity does not vary when the temperature changes. If you have an old car and the warranty has expired, you should still use a good oil. Most modern oils are labeled with SG or higher (e.g. SL). The "higher" last letter, the better the quality of oil. Most major supermarkets and chains that sell cheap oil, actually have a quality higher than the SG label. What type of oil you need is in the instruction manual. This may be one of the most popular called 5W40. When there are two figures, it is a multi-grade oil, which can be used for all-year operation. W stands for Winter. The numbers stand for the viscosity, in which 5 is good when the oil flows through the engine and lubricates at low temperatures, and 40 where the oil is solid at high temperatures. What Does the Oil in Your Car Actually Do?